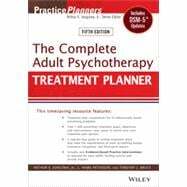 The Complete Adult Psychotherapy Treatment Planner, Fifth Edition, is fully revised to meet the changing needs of mental health professionals. This time-saving resource now reflects DSM-5 diagnostic suggestions and detailed evidence-based treatment plan language required by many public funding sources, private insurers, and accrediting agencies. The Fifth Edition features treatment organized around 43 main presenting problems, including depression, intimate relationship conflicts, chronic pain, anxiety, chemical dependence, borderline personality, anger management, and phobia. Its easy-to-use format helps clinicians to locate treatment plan components by behavioral problem.